Oh my god, and THIS ONE?! What is this guy, the Dutch Jan Terri? I am kind of falling in love with him. I alos love that he references the scooter song below. This is changing my life. Last year I cut this concert film for my friend Nader and today I see the whole thing is on Youtube. Who knows if it is supposed to be, but it is. Check it out. It rules. Back with some more death n’ roll, Kvelertak’s new video for “Månelyst” is an homage to all the schlocky horror tropes that we as metalheads hold so dear to our hearts. And that’s the thing about metal which people who don’t like metal usually don’t understand. We don’t get into extreme metal because we are gore-obsessed sociopaths, but because we are horror-movie-loving geeks who find the same escape in our music as we find in our movie selection. Horror and metal go hand-in-hand, always have, always will. Kvelertak are playing on that in this video with allusions to all sorts of classic horror movies. You’ve got vampires! You’ve got gimps! You’ve got bloodied tools! You’ve got monsters in the woods! You’ve got blood and darkness and death and gore and it works so magically I want to hug it and whisper nice things in its ear. This is awesome. Not quite as terrifying as Cyriak’s normal work, but magnificent nonetheless. 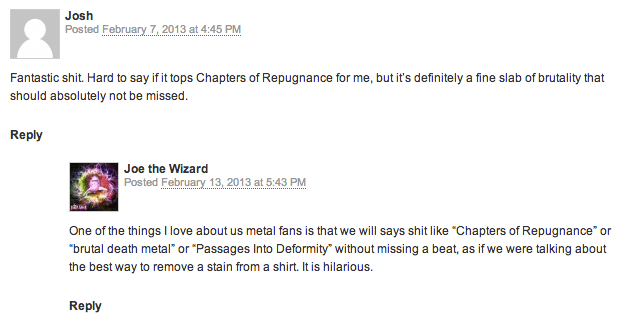 A thing I love about metalheads. A little bit ago, I was listening to the stream for Defeated Sanity’s Passage Into Deformity and reading the accompanying article. I had a thought which I expressed in a comment on the post. I’ve said things like this thousands of times over the 20 years I’ve been listening to metal, and I don’t foresee it stopping. As metalheads, we are so accustomed to absurd song/band/album titles that it becomes a total nonissue for us. We can talk about Once Upon the Cross by Deicide, or a band called Torture Killer, or whether or not you think Goatwhore is a solid example of the New Wave of American Black Metal without thinking twice about the actual words you are using. I am sure that an intrepid explorer of old blog posts could find tons of examples on this very site. We can say absolutely vile things unfazed because we’re used to them. Quickly scanning my Spotify death metal playlist reveals the following song titles as perfect examples. That list took me about 1 minute to compile. Consider it a random sampling of bands that start with the letters A through D. A THROUGH D. THAT IS AS FAR AS I GOT THROUGH THE LIST. And I didn’t even dig into me black metal or grindcore playlists. No one whose idea of heavy metal ends at Metallica could say the song titles above without being acutely aware that the words they’re uttering are just not normal. But metalheads? Nope. No problem. And there are lots more where those came from. And I will say this in closing, I’ve only ever really listened to Broken Hope’s The Bowels of Repugnance, but recently gave Grotesque Blessings a listen and, man, that is a good record. I might have listened to this album about 100 million times in college. It was (and is) perfect music for writing: lyricless, not too obtrusive, but still forward enough to block out other sounds, distractions, and thoughts. And the video is amazing. Stylish. Fitting. Unique (and I don’t use that word lightly). I seem to recall having a tiny 320×240 quicktime of it on an old 18gb hard drive. Ah, halcyon days.